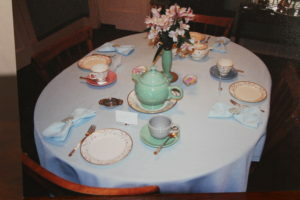 The second table setting using Homer Laughlin’s Nantucket is an afternoon tea party. I kept the same tablecloth and napkins (Walmart) and switched out the flatware to my Great-grandma Mayer’s silver plated Coronation set. I also traded the pink floral napkin rings to the blue ones (thrift store) of the same design. Nantucket salad plates (thrift store) are at each setting, and two Nantucket tea cups are on coordinating Rose and Periwinkle Blue Fiesta saucers, and mix-matched Fiesta tea cups in Pearl Gray and Sea Mist Green (various sources) round out the other two covers. Also at each cover are silver plated tea pot place card holders (In Cahoots for Tea, Great Falls, Montana) with cards of the guests’ names. Nantucket milk jug and covered sugar are at one end, and a Fiesta tea pot in Sea Mist Green (gift) snuggles in a Nantucket soup bowl. To the left of the tea pot is a stainless steel tea leaf strainer (thrift store); I never use bagged tea at an afternoon tea party. The simple centerpiece is a Fiesta bud vase in Sea Mist Green (Herberber’s) on a mirrored holder (Ben Franklin Crafts), flanked by two Lenox ashtrays (thrift store) serving an adaptive reuse holding little after dinner butter mints. Nantucket afternoon tea party table setting, 2008.